The race for Olympic qualification is hotting up and the Stihl SA XCO Cup Series events are a battleground for the country’s top cross-country racers. 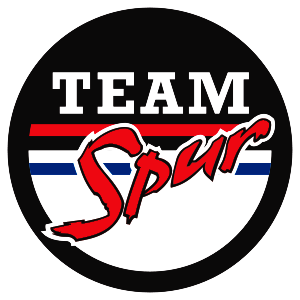 Having won the first outing in Mankele and then finishing a disappointing fifth in his hometown race at Helderberg, Team Spur’s James Reid had a point to prove. The new Wolwespruit course, just outside Pretoria, was the scene of the fierce tussle for the podium. Reid broke away fairly early in the race, and worked hard to build a comfortable lead over second placed Brendon Davids (Trek Racing Team). Philip Buys (Scott Factory Racing powered by LCB) trailed in third and Alan Hatherly (Kargo Pro MTB Team) was a long way back in fourth. James emerged victorious, despite a nasty crash in the final lap of the race. James now looks to the high mountain trails of Afriski Resort in Lesotho, which play host to the African Continental Championships this weekend. “It’s super important for my Olympic hopes and this back-to-back racing is similar to what we experience in Europe racing UCI World Cups. It should be interesting to see what happens this weekend,” James said. It was a ‘management’ day for Annika Langvad and Ariane Kleinhans on Friday’s 93km transition Stage 5 from Wellington to Stellenbosch – billed as this year’s Queen Stage for its 2500m of climbing. The day was won by the Sport for Good pairing of German mountain-biking legend Sabine Spitz and her Ukranian partner Yana Belomoina. The four rode together for most of the day, with Annika and Ariane eventually letting their competitors go, and crossing the line two minutes behind the Sport for Good pair. The ride consolidated Team Spur-Specialized’s overall lead however, and they have a healthy gap of almost 14 minutes over second-placed Topeak Ergon. Annika called it a “perfect day… it only got hot towards the end after being quite cool,” explaining how they didn’t think that they would have a good day due to all the climbing – which usually doesn’t favour her and Ariane. “We were actually surprised; we paced ourselves very well and got a good result out of it in the end. With two days to go the lead we have gives us a very nice feeling. We appreciate every second so to add another minute today is perfect. It means that if we get a puncture or anything we can take our time fixing it,” Annika added. With two technical stages still to come, Ariane was not willing to let her thoughts turn to the Grand Finale at Meerendal just yet. Thursday’s Stage 4 of the Cape Epic lived up to its hype and produced spectacularly close racing among the top women’s teams. In the end Ariane Kleinhans and Annika Langvad of Team Spur Specialized took the win by a nail-biting five seconds over Team Sport For Good’s Sabine Spitz and Yana Belomoina. After the sudden and sad withdrawal of Jennie Stenerhag of second-placed Team Ascendis Health on Stage 3, all eyes were on the German, Spitz at the start. The Olympic Gold medalist and multiple World Champion was in her element on the 75km stage through the renowned trail network of Welvanpas outside Wellington. She was paired up with Ukranian U23 World Champ, Belomoina, an explosive talent also accustomed to shorter, high-intensity racing. The roller coaster course featured punchy climbs and high-speed singeltrack and rewarded the aggressive pace-makers, Sport For Good with an early lead. After four days of sweltering heat, overcast skies made for sublime riding conditions but red-hot racing. “We found ourselves in an early struggle for second-place with Team Topeak Ergon,” Ariane explained at the finish line. But our ladies kept their heads and soon dispatched the Topeak team. “We weren’t sure of the gap to Sabine, but we just kept the pace and were able to bridge to her and Yana,” Ariane said. The four riders then started working together, to turn up the heat on the chasing Topeak team, putting their technical skill to good use and stretching their lead. By Waterpoint 3 the quartet had built a lead of 90 seconds, but the bar-to-bar race for the finish line between Team Spur Specialized and Sport For Good, pushed their advantage to more than five minutes over Topeak by the time they were safely home in Wellington. The closing kilometres saw Annika set a furious pace. “I just went as hard as I could, so no one could come around,” the Dane confessed. The tactic worked, and Ariane and Annika rounded the final bend in the finishing chute first and claimed their third stage win. Stage 5 is going to be a head game. It’s not the longest of this year’s race, traversing just 93km, but its five brutal climbs and total vertical ascent of 2500m has earned it the intimidating status of “Queen Stage”. Ariane and Annika will need to ride within themselves yet be ready to fend off early attacks from teams looking to chip away at their over 10-minute lead. Another day of riveting racing awaits for our women. It was another hot and dusty day for Stage 3 of the 2016 Absa Cape Epic, over 104km from Tulbagh to Wellington. 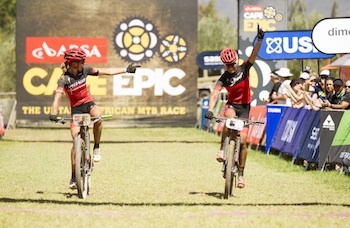 Ariane Kleinhans and Annika Langvad of Spur-Specialized moved a step closer to clinching their third straight Absa Cape Epic title by winning the stage in a time of 5:18.47. Although our Swiss-Danish pair arrived at the Cape Peninsula University of Technology’s Wellington campus 32,1 seconds ahead of Team Topeak Ergon, they didn’t have it all their own way today. The three contenders in the Women’s category, as well as Sport for Good, remained within a minute of each other at all three water points on the 104km transition stage from Tulbagh. While it didn’t end in a sprint finish, they all described the racing as fierce and exactly what the women’s category has been calling out for. “We were all four teams together the whole time. It was super exciting! We got ahead over the first climb but then it was brought back again and we rode together up to Bainskloof Pass and into the trails at Welvanpas. You could just feel the tension building…” Ariane said at the finish. “I didn’t see that coming,” Annika told Ariane as they celebrated their victory. “It was a very close race and we had no idea how it was going to finish. The racing was very tough because we were all together until the last 20km or so,” said Annika. The Dane believes that it was their strategy and mental fortitude that saw them eventually emerge from the pack to win. Our women’s team found themselves opening a gap on Topeak Ergon’s Sally Bigham and Adel Morath as well as Robyn de Groot and Jennie Stenerhag from Team Ascendis Health over the final kilometres. They carved the loose and dusty corners with expert precision to emerge at the finish line with a slender lead. Sadly, after making much of the day’s racing by driving the pace and attacking the singletrack descent, Team Ascendis Health’s Jennie Stenerhag experienced health issues on the finish line, and will be unable to continue the race. Her partner Robyn de Groot will continue to ride alone in the Outcast jersey. We wish Jennie a speedy and full recovery. Ariane and Annika will look to box clever again on Thursday’s Stage 4, which will start and finish at Wellington and take place almost exclusively on the highly regarded Welvanpas trail network. By Absa Cape Epic standards it is short – only 75km – but has some sharp climbs and an accumulated altitude gain of 1850m. The tight singletrack will favour the cross country specialists, such as Sport for Good’s Sabine Spitz and Yana Belomoina. Look out for fierce racing up front. Absa Cape Epic: Our Ladies are Back! With textbook stage-race pacing, Ariane Kleinhans and Annika Langvad of Team Spur-Specialized won the Women’s category of the 100th stage of the Absa Cape Epic in Saronsberg, on Tuesday. It was an intriguing day’s racing in the Sasol Women’s category, with the defending champions surging to victory and taking the overall lead with a stage time of 5:06.00,2. For much of the stage the Spur-Specialized pair played a tactical game – biding their time in third place behind Team Sport for Good’s Sabine Spitz and Yana Belomoina and Sally Bigham and Adel Morath of Team Topeak Ergon. “I could definitely feel yesterday’s effort,” said an elated Ariane at the finish. “We kept it really, really steady. Even when Sabine and Yana went up the first climb, we just let them go – and I think that paid off,” she said. Significantly, Ariane and Annika remained ahead of the erstwhile race leaders, Robyn de Groot and Jennie Stenerhag of Team Ascendis Health. By the time Ariane and Annika stormed back to Tulbagh, their 58-second deficit had turned into a three-minute, 17-second lead overall. “Just before the top of the first climb we overtook the orange jersey holders [De Groot and Stenerhag] and headed into the downhill ahead of them. Then it was a ding-dong battle from there. We hung tight and after the third water point we could see Sport for Good,” Ariane said. Ariane dived into the final descent with Annika hot on her heels. The pair blitzed the mammoth downhill, overtaking the two leading teams – Sport for Good and Topeak-Ergon. “We manged to do everything right on today’s stage, and that’s why we’re in orange now!” Annika added. “I’m Incredibly happy – can’t even describe it – it’s an emotional win!” said Ariane. The importance of the win was perhaps best described by long-time Absa Cape Epic commentator and analyst, Neil Gardiner. “It was a significant victory not only because it puts them back in orange, but because they bounced back from a disastrous Stage 1 the previous day,” he said. “If you can stay in the race, stay in the game, it’s all about waiting for another day when your luck will change, because inevitably it does. Yesterday was probably one of the worst days Ariane has had on a bike – she fell, she was struggling with her fitness, she had a mechanical and she was overtaken in the last couple of kilometres – hugely demoralising, really. Everything that could go wrong, went wrong,” he said. “But today, she was rewarded with her patience, she stayed in the game. Nothing better than that, when you’ve overcome the adversity,” Gardiner added. James Reid and partner Gert Heyns were dealt a harsh dose of reality with a race-ending illness to Gert on Stage 1 around Tulbagh. The youngsters were mixing it up in the early going, hoping to hold onto the African leaders’ jersey that they earned after their superb Prologue race on Sunday. Alas, as the day wore on, Gert succumbed to lingering flu symptoms and James was forced to nurse his compatriot to Waterpoint 3, where Gert withdrew. James will continue to race on his own in the white Cape Epic “Outcast” jersey, reserved for professional riders whose partners have been forced to abandon.